On the surface, the Earth Executive VIP Tall director’s chair is simply a folding chair, but looks can be deceiving — this solid, thoughtfully-designed chair offers a host of features. An anodized aluminum frame has an impressive 375-pound weight limit, yet is lightweight for easy, folding portability. 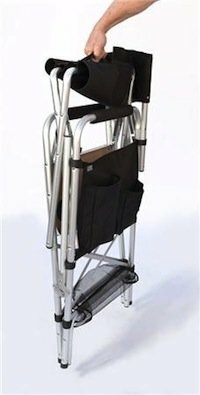 Unique eight-point ground contacts and four side bars ensure rock-solid stability, and convenient touches abound, from a pop-out side table with cup holder to dual side pockets for small item storage.